1.83 m (6-ft.) mini-stereo dubbing cord commonly used with multimedia speakers and other audio devices. 3.5mm stereo male to male connectors. With Tripp Lite’s P312-006, you can establish a high-quality audio connection for devices equipped with standard portable headphone jacks. 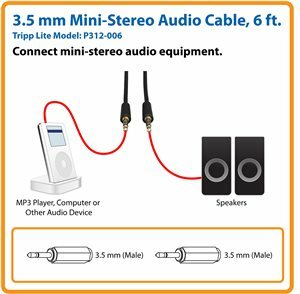 This 6 ft. Mini-Stereo Audio Cable features two 3.5 mm male connectors that fit most portable audio devices, including iPods, iPhones, iPads, Android devices and MP3 players. The P312-006 also establishes audio connections with PCs, receivers, microphones, sound cards and any other audio device equipped with a 3.5 mm jack. Simply insert the male connectors into the audio source and output for high-fidelity sound. Manufactured using only top-quality materials, the P312-006 has gold-plated connectors to ensure excellent conductivity with minimal signal loss and optimal clarity. Single-piece, molded construction offers durability and long life. For peace of mind, this cable is backed by a lifetime warranty. It’s also manufactured in compliance with strict RoHS specifications, reflecting Tripp Lite’s commitment to environmental responsibility. Your Tripp Lite cable will be shipped to you in its original Tripp Lite packaging (poly bag with Tripp Lite logo; see photo). This is your assurance the cable you purchase will deliver the superior performance you expect. And if you don’t see this packaging, it’s not a genuine Tripp Lite cable! P312-006 3.5 mm Mini-Stereo Audio Cable (M/M), 6 ft.